The Trump administration's abortion policy on foreign aid is having a devastating effect in local communities that require medical assistance, according to a new report. Investigators from the Center for Health and Gender Equity, or CHANGE, issued a report Tuesday on what's known as the "Mexico City policy" or the "global gag rule" -- what the Trump administration calls "Protecting Life in Global Health Assistance." The policy requires that any foreign group -- nongovernmental organization (NGO) or for-profit -- that receives U.S. global health funding cannot perform or actively promote abortion as a method of family planning -- or else they'll be stripped of their U.S. funds. Trump's policy is an expansion of past Republican presidents in that it now affects all global health funds -- a total of $8.8 billion -- for groups that do family planning, reproductive health and maternal and child health care, but also those that target HIV/AIDS, infectious diseases, malaria, nutrition, tuberculosis and more. Trump signed an executive memorandum reinstating the policy, overturned by Barack Obama in 2009, on his first Monday in office. 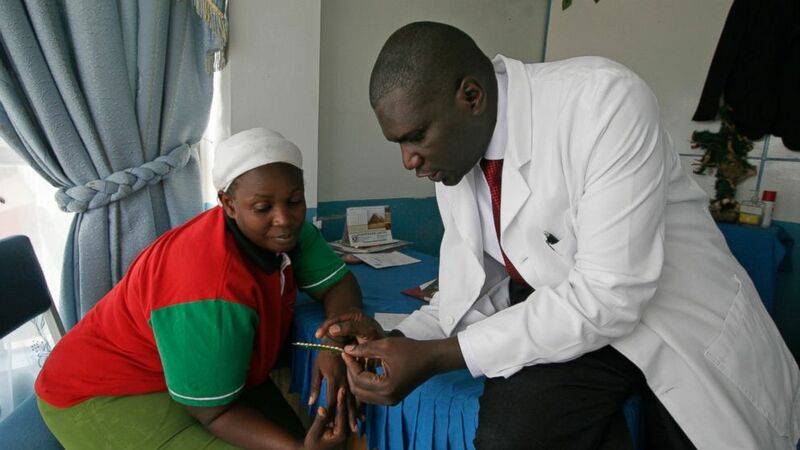 (AP) In this Thursday, Jan. 29, 2009 file photo, Dr. Aron Sikuku, right, explains family planning pills to Beatrice Ravonga in the Kibera slum of Nairobi, Kenya. U.S. President Donald Trump's move a year ago to dramatically expand cuts in U.S. funding to foreign organizations providing abortion services has left impoverished women around the world without access to treatment for HIV, tuberculosis, and malaria, health groups say. The report demonstrates that the new restrictions have led to cutbacks for groups on the ground, many of whom are reliant on U.S. funding. "We were operating last year in 17 countries, and by the end of or by sometime next year, those will all be shut down -- all those projects," one anonymous organization told investigators. The report's fieldwork focuses on Zimbabwe and Mozambique, where one group, the Mozambican Association for Family Development (AMODEFA), will lose 60 percent of its budget next year -- leading to 10 of its 20 health clinics closing and 30 percent of its staff getting laid off. At one of its HIV clinic, for example, AMODEFA consulted 6,799 girls and young women under 24 years old and tested 5,981 of them from July to September 2017. During a similar time period in the new fiscal year -- October to December 2017 -- they consulted only 833 and tested only 671. The report argues that the policy does not reduce abortions, citing research from when it was in place under President George W. Bush. It also argues the Trump administration did a poor job rolling it out and explaining the details of it, leading to confusion that has exacerbated the problem and caused doubts about organizations' funding. 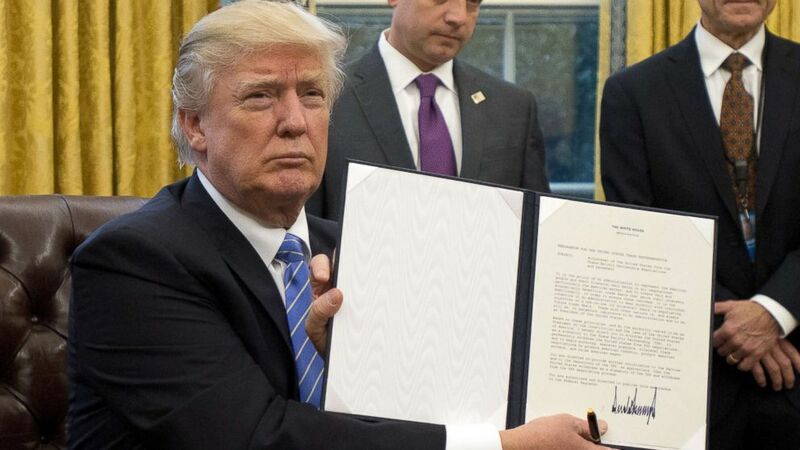 (Ron Sachs/Bloomberg via Getty Images) President Donald Trump holds an executive order titled "Mexico City Policy", which bans federal funds going to overseas organizations that perform abortions, Jan. 23, 2017. The State Department conducted its own review of the policy after its initial six months in 2017 and found that partner organizations "largely accepted the policy" and several submitted comments in support of it -- "despite several NGOs having provided submissions detailing early harmful impacts of the policy," according to CHANGE. ABC News has reached out for comment from the State Department on the findings of the new report, but have yet to hear back. The report argues that the impact spills over into other areas, including women's empowerment: "One NGO has been forced to discontinue a project that reached 14,000 AGYW [adolescent girls and young women] in Uganda with information and services on HIV and economic empowerment because the prime partner could not comply with the GGR." The International Planned Parenthood Foundation estimated it would lose $100 million in U.S. funding under Trump, leading to 20,000 maternal deaths, 4.8 million unintended pregnancies and 1.7 million unsafe abortions, the group reported. Many organizations have cut those funding ties with the U.S. because of the policy, some out of solidarity or principle. But many are forced to because their work inherently involves reproductive health care and they at least present female patients information about abortion. That includes groups that counsel women on gender-based violence -- or focus on HIV/AIDS treatment. "I think that really creates a fear that HIV rates will go up because there’s no longer this availability of funding," a representative for WaterAid told CHANGE.